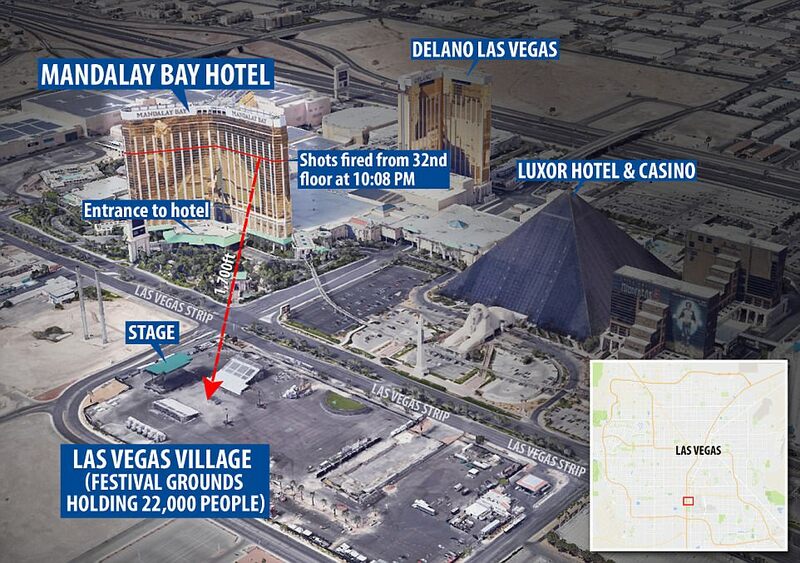 I can't imagine being the person with the room NEXT to the shooter's right now. I guess it would just reinforce the idea that it was planned, and not spontaneous mental snapping? He apparently checked in using the woman's ID? There's a conversation with the next door guy ... he slept through it all and the cops woke him up ... he though HE was being arrested. "He who shall not be named?" Wasn't there some books that pointed out the silliness of that. How do you sleep through that much gun fire? It must have been one big corner room then? With the shooter just using two different windows? Mandalay Bay does have some larger suites with one and two bedrooms. It could be a large room offering different angles. Also I don't know if you can get adjacent rooms and open a door to join them. Large quantities of C2H6O and/or a loud air conditioner. Brother: No gun guy, no military background, how did he get those weapons? I've been to Vegas with long guns. Some brought with, some purchased (when it was still legal for Californians to do so) at the Great Las Vegas show - never an issue with bringing firearms into the hotel and having them stored in the hotel's vault for safekeeping or in the room where I was staying. Has anyone determined the rate of fire from the audio? Seems like trivial task with pc audio software. You're kidding, right? AR15-style semi-auto rifles are universally available at any place that sells guns, and as noted above, it's easy to get gadgets that simulate auto fire. Last edited by Bob001; 2nd October 2017 at 08:45 AM. True...however, if we can take it away from those who commit these kinds of acts, it might start the ball rolling so we can take it away from those who commit larger acts, as well. If there's no notoriety or public fascination with the people who act this way, it might help prevent it. If we talked endlessly about the victims, but the shooters were the nameless and faceless footnotes, the losers wanting to make history wouldn't see this kind of behavior as an avenue. He lived in Mesquite, which also has casinos. I wouldn't be surprised if gambling addiction played a part in this. There may be, but I know this. LHO would be the happiest man in captivity if he survived and knew his name was still under discussion in 2017. Ak's and M16 (AR15's) .. can have similar fire rates ... AK are normally a bit slower but it depends. But with TEN firearms there? could be both. Latest report: At least 58 dead, 515 injured to varying degrees. Last edited by Bob001; 2nd October 2017 at 08:50 AM. Typical know-nothing soundbite the media loves. 58 killed and 515 injured. Sounds like full auto M-16, IMHO. Does not sound like bump firing. Too regular. But no need to speculate, it will get known exactly, sooner or later. IMHO 'where did he get those guns' is perfectly relevant question. I'm curious what the rate of fire was first before trying to line it up with the firearm/add on. True. But we can assign nicknames so everyone knows who-is-who. Just make sure they're the kind no macho sniper guy wants. I submit Steven Paddock is now "Stubby Pink". If no one, anywhere, ever uses his real name again this kind of crap might stop happening. Sure, it's a long shot (no joke intended ) but it might work. I've only used Tim Mc ****'s name once since the bombing, but everyone knows who I'm referring too. It just has to be a group effort, and carried 'round the 'net 'til as many people as possible join. I'd love to see the same on the court documents and news reports. Just stop giving these types the attention they're seeking, and see what difference -if any- it makes. Edited by Agatha: Edited to remove breach of rule 10. Last edited by Agatha; 2nd October 2017 at 10:11 AM. I'm heading to work, but if someone wished to calculate a rate of fire, we can resolve that. I would take the most likely probability and bet it wasn't fully automatic. Last edited by BobTheCoward; 2nd October 2017 at 08:56 AM. The same brother who said they rarely contact each other and lived very far apart? And some because of mental illness. Should we make them subhuman as well? The day after Labor day I was essentially across the hall from that room. On a Washington Post video someone in law enforcement, might have been the sheriff, is overheard saying the gunman fired around 4,500 rounds. How would they know? I guess they'd have to count the shell casings they find in the room. Probably not their number one priority but I know they will do it at some point. If you're going to try to calculate on published cyclic rates numbers you may or may not get a good estimation of firearms type. Published cyclic rate numbers are mechanical estimations and don't account for various factors (ammunition type and quality, mechanical friction factors and weather factors) that effect the CR - it also doesn't account for what is generally the practical rate of fire when used properly - sort controlled bursts - as opposed to a magazine or belt dump. Last edited by Ron Swanson; 2nd October 2017 at 09:06 AM. Reason: Edit to "Rounds per MINUTE"
Not an issue at all. Hang the do not disturb sign or just be inside the room and say no thanks when they knock. And if they did so what? It isn't like the staff would automatically know the guns were illegal. Absent the qualifying factor of committing mass murder, no.